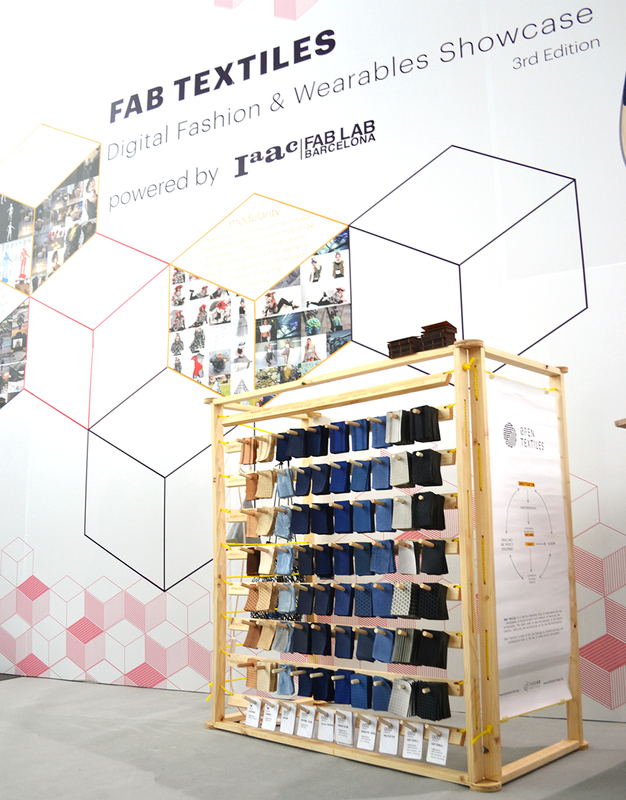 The 3rd edition for the Digital Fashion and Wearables was exhibited during Fab12 Conference in Shenzhen and counted with the participation of many diverse and versatile projects. 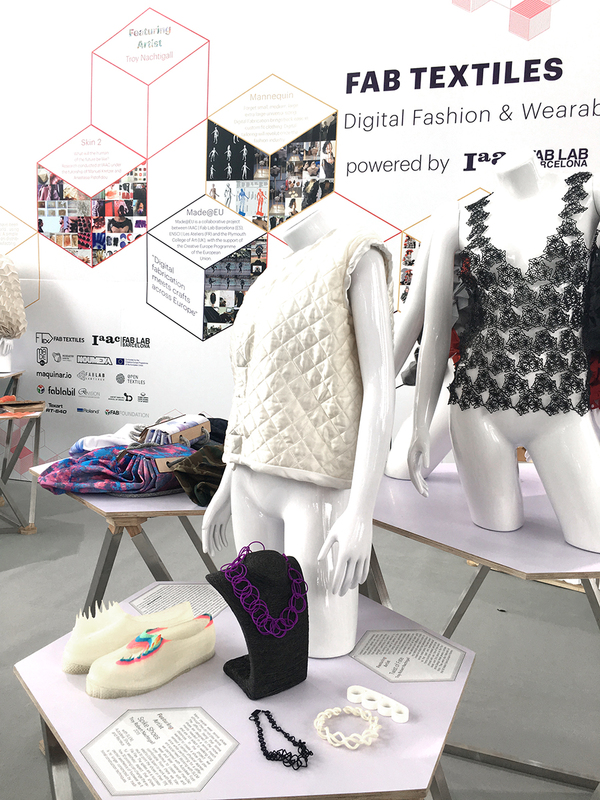 Our mission is to showcase projects that demonstrate digital fabrication applications in education, research and entrepreneurship that are transforming the fashion industry and innovating its technologies creatively. 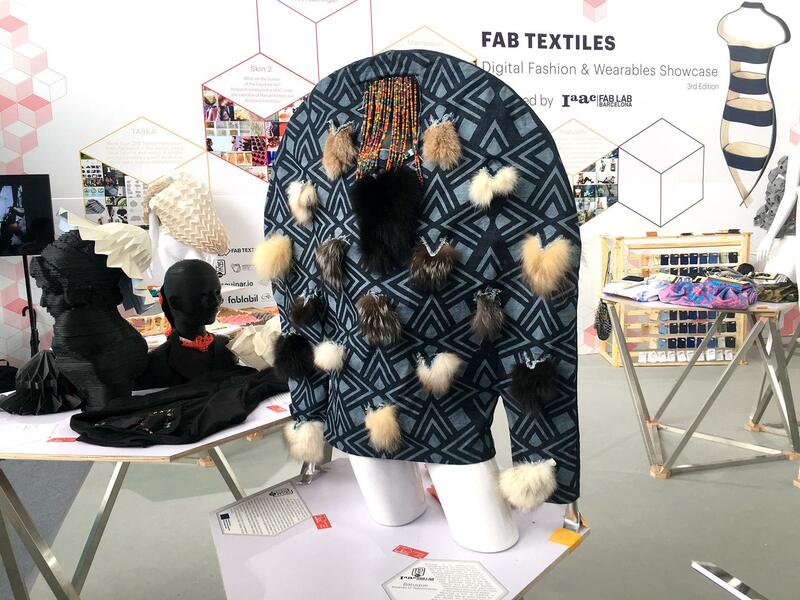 Extended material catalogues from Fab textiles, OpenTextiles and Fab Lab Il form part of the parallel research being conducted in the fab labs. 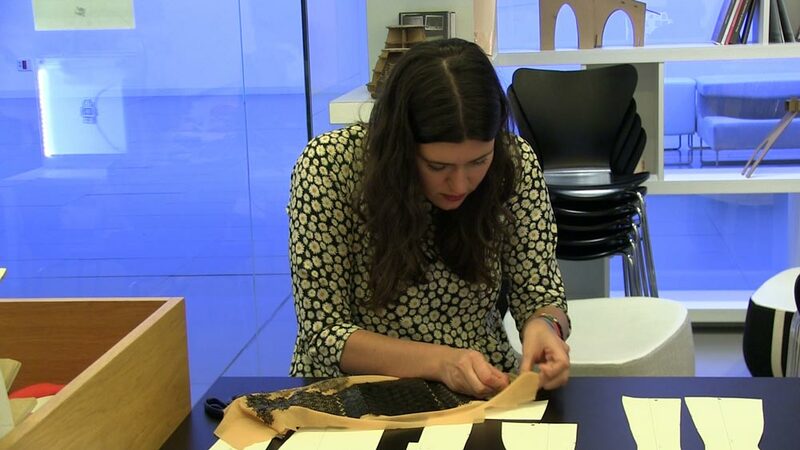 The material catalogue is one of the most important steps when investigating and is part of the textile lab inventory. All the research conducted is being gathered and documented in the forms of tangible material catalogues that can pass from generation to generation of investigators that explore the possibilities of each technique and material and empower parallel developments. 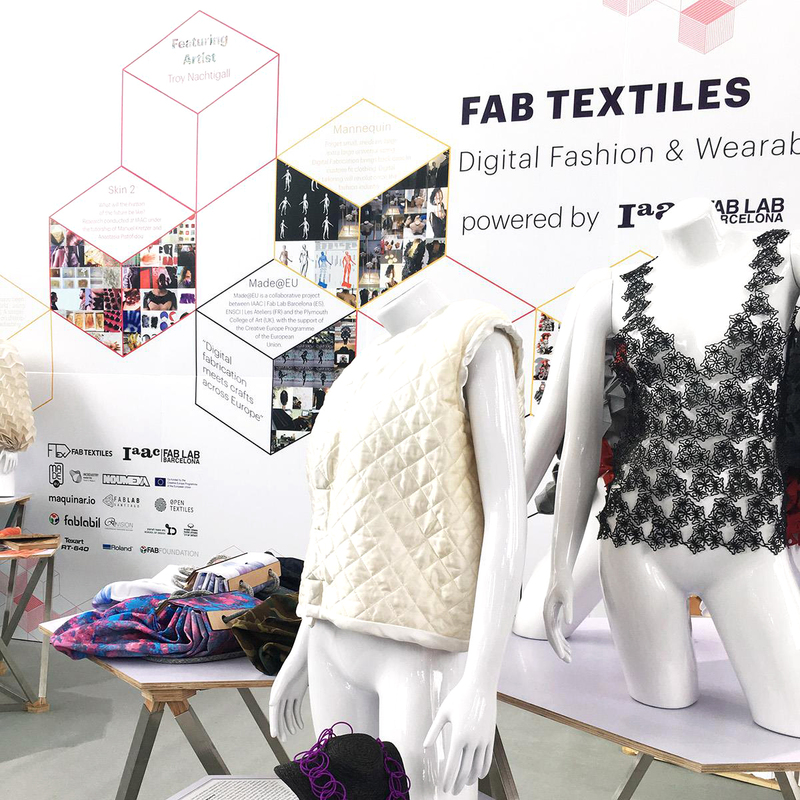 Two projects developed during Madeat.eu residencies under the mentorship, technical support and guidance of the Fabtextiles captured the attention of the public for the artistic applications in the field of performative arts that wearables are bringing to the textile and fashion industry. 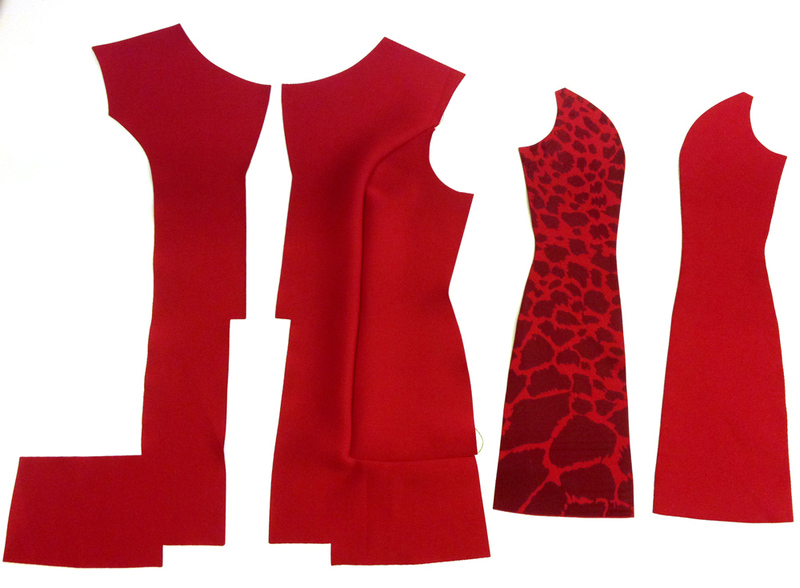 Elastica a wearable suit developed by Cristian Rizzuti controls sound by the dancing. The artist proposes new mediums for creation for the performers to extend and augment their body using it as an instrument that harmonically brings sound and movement together. Batuque developed by Ricardo O’ Nascimento, inspired from the Afro-Brazilian faith Candomblé, creates a creature like ceremonial atmosphere that moves with the rhythm of the sound. 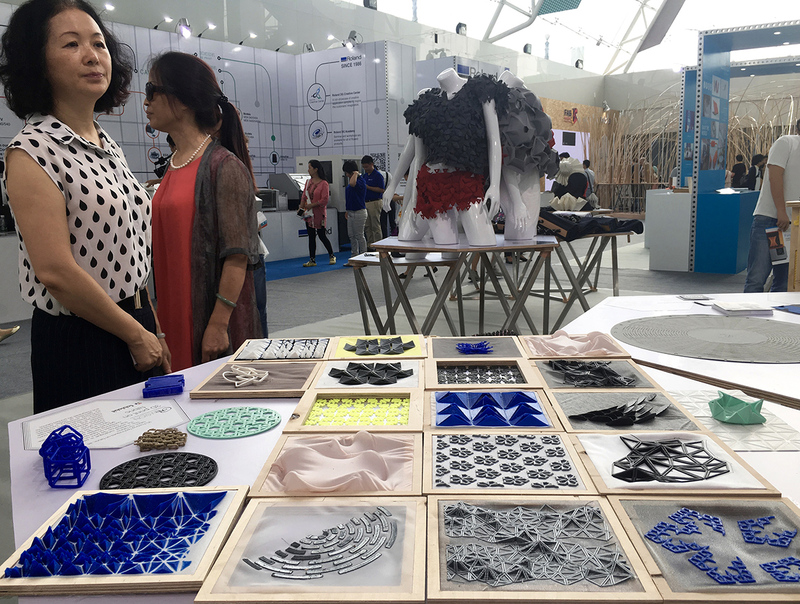 Products that emerge and can be produced in small series prove the ability of the Fab Labs to favor new talented designers, generate new markets and empower circular economy models. 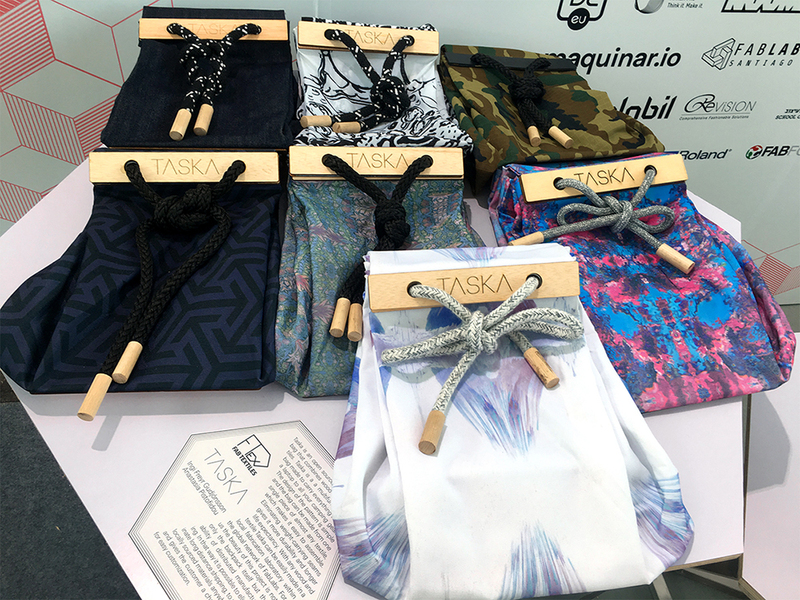 Taska Bag is one of them, having fabricated more than 100 versions in a distributed manufacturing to eliminate long distance shipping, to use locally sourced materials anywhere and gives the customer a change for easy customization. Maquinar.io is a project of Fab Lab Santiago that works with local designers and has an online shop with innovative products made in Chile. 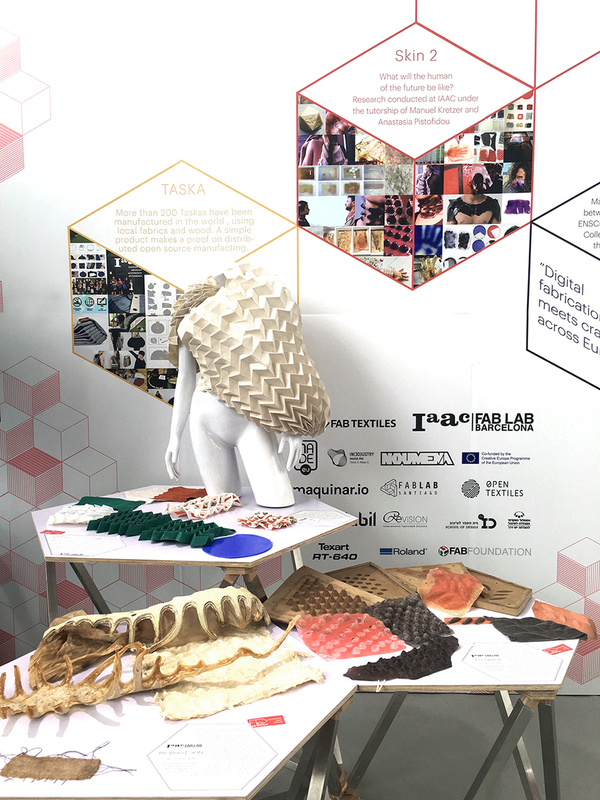 Beyond conventional materials goes the research conducted by IAAC students on the seminar Skin2. The seminar seeks to answer through prototypes and speculative design what will the human of the future be like by augmenting the self and extending the body. 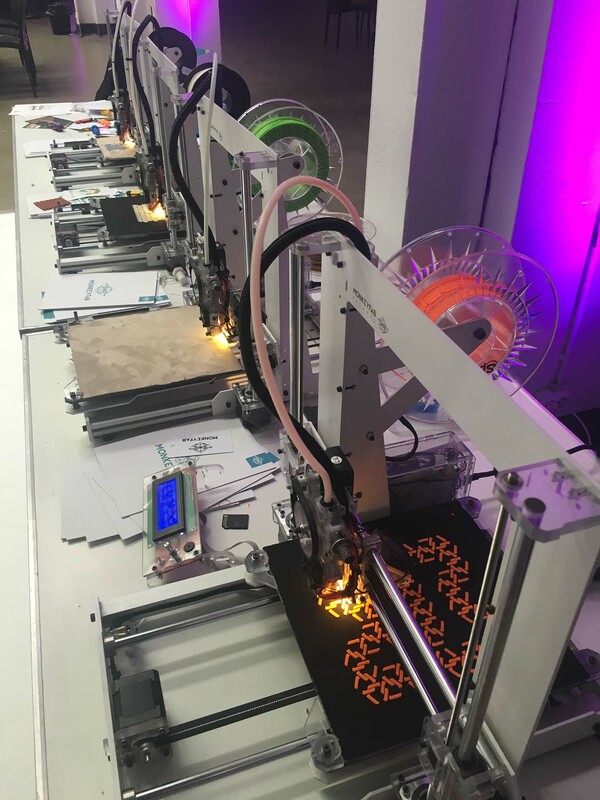 Working with bioplastics and kombucha supplemented through embedded electronics a crucial task for the students was to think about futuristic applications and implications of a second skin. 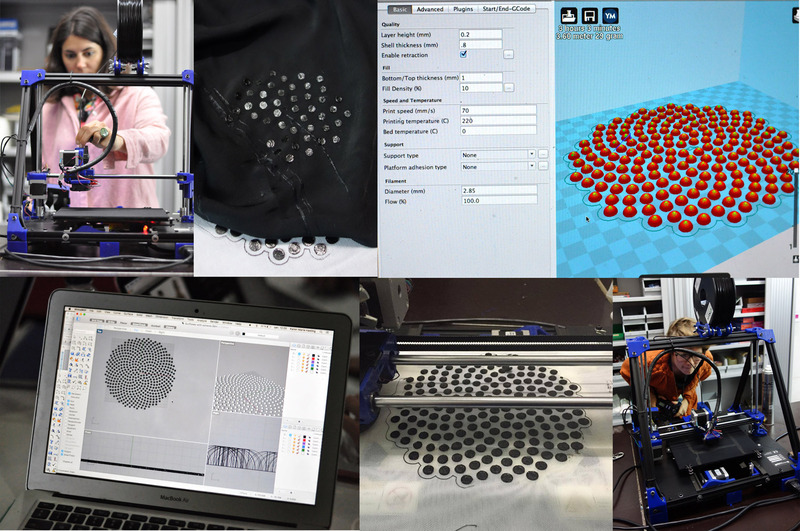 This is a quick tutorial to make your 3D printing on fabrics. This samples have been realised during the workshop at MCE3 conference in Warsaw. 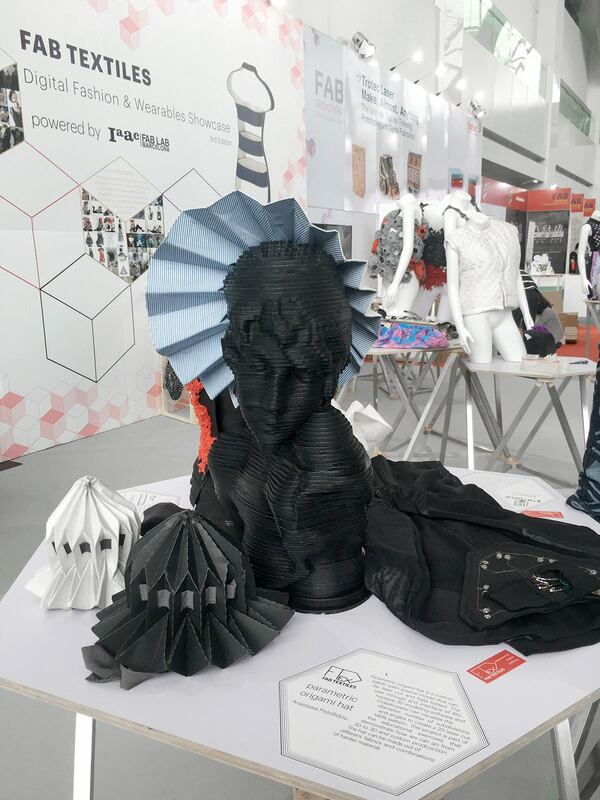 That shows you how 3D printing with rubber filament adheres on textiles and what kind of geometries you can try to print. The 3d printers are from Monkeyfab, that supported the workshop during the conference. 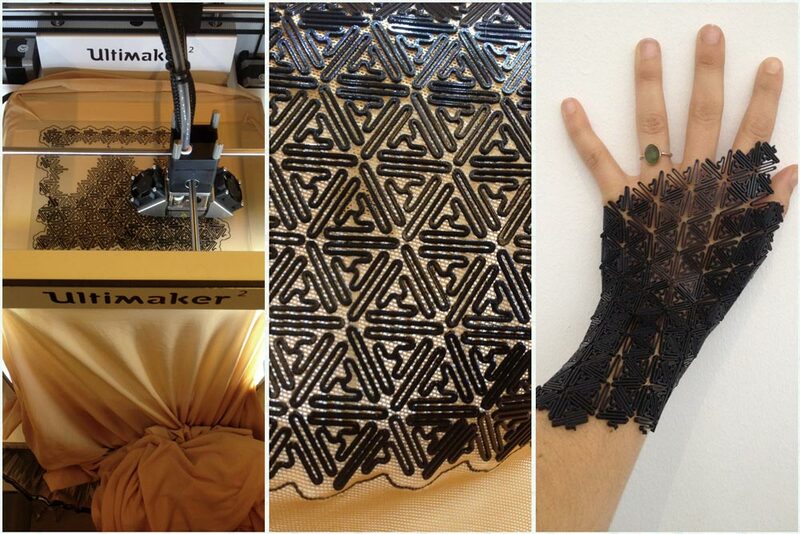 1)To make the fabric fixed during the printing, put double sided tape on the platform of the 3d printer. 2) Now you can place the fabric. Be careful, don’t stretch it if you don’t want deformations on the result. 3) You have to readjust the nozzle height so that you fine tune the distance between the fabric and the extruder. 6) prefer undulated outlines than clear shapes because the total perimeter length is bigger so you have more adhesion strength. 7)The fabric preferably needs to be a little bit fluffy. On more synthetic fabrics or wider mesh fabrics the adhesion was not as good as the “hairy” ones. 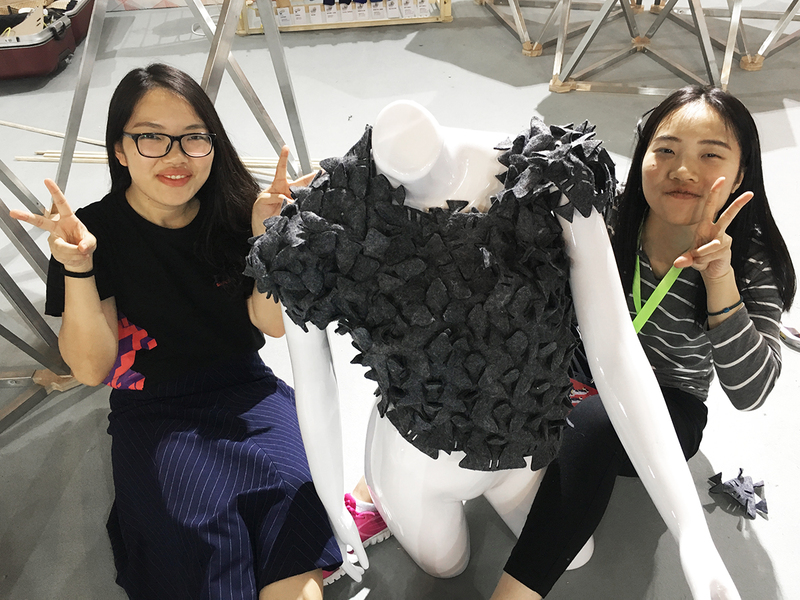 The process of printing on fabric is quite direct, you have to attach the fabric with black clips on the printing platform and readjusting the nozzle according to the fabric height. After some experiments on different fabrics we ‘ve noticed that 1mm hole meshed fabric does not adhere properly on the surface. We have tried on viscose and on lycra and it works , still need more tests. 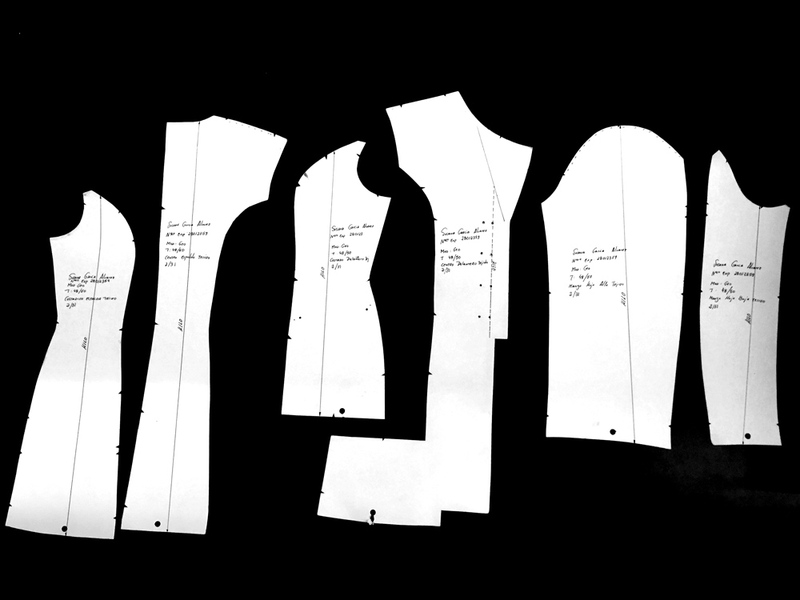 According to different fabrics and and 3d models you can impose forms on the fabrics, 3d volume, different weight and deformation. 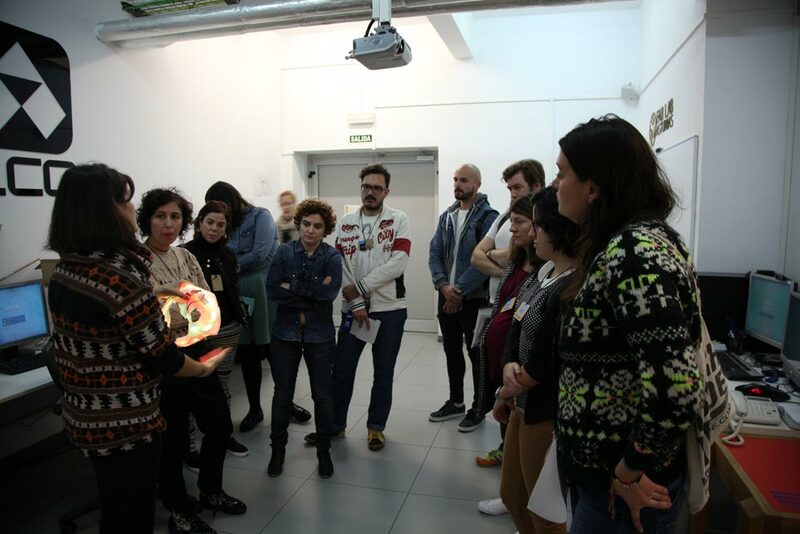 Laboral organised a meeting on community and the critical use of technology with a weekend programme of presentations, round tables and workshops in November 2015. Here you can see the streaming of the presentation. 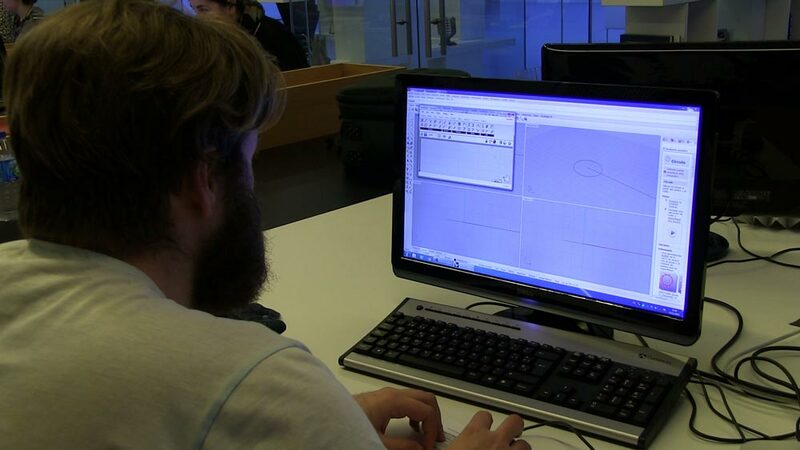 WinterLAB is aimed at exchanging community work experiences that foster the creative use of technology and bring the new media for creation and production closer to the public.The aim of the hands-on workshops is to disseminate maker and DIY culture among the general public and, at the same time, provide professionals with open source tools and techniques suitable for creative projects. 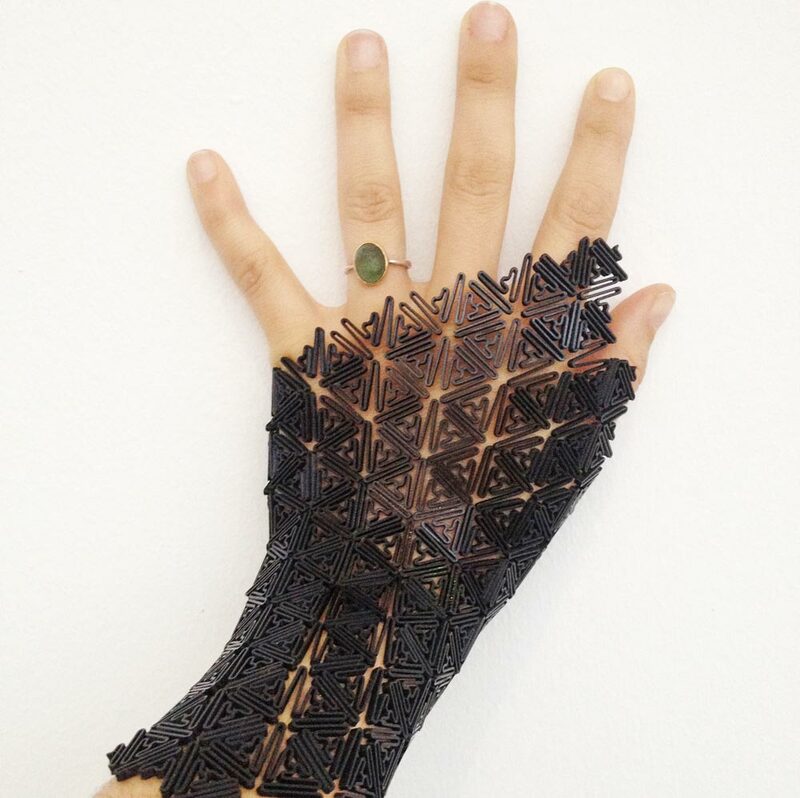 The workshop was an overview of techniques and digital fabrication methods where different background participants worked with 3D printing on Fabric, 3D modeling and laser Cutting. 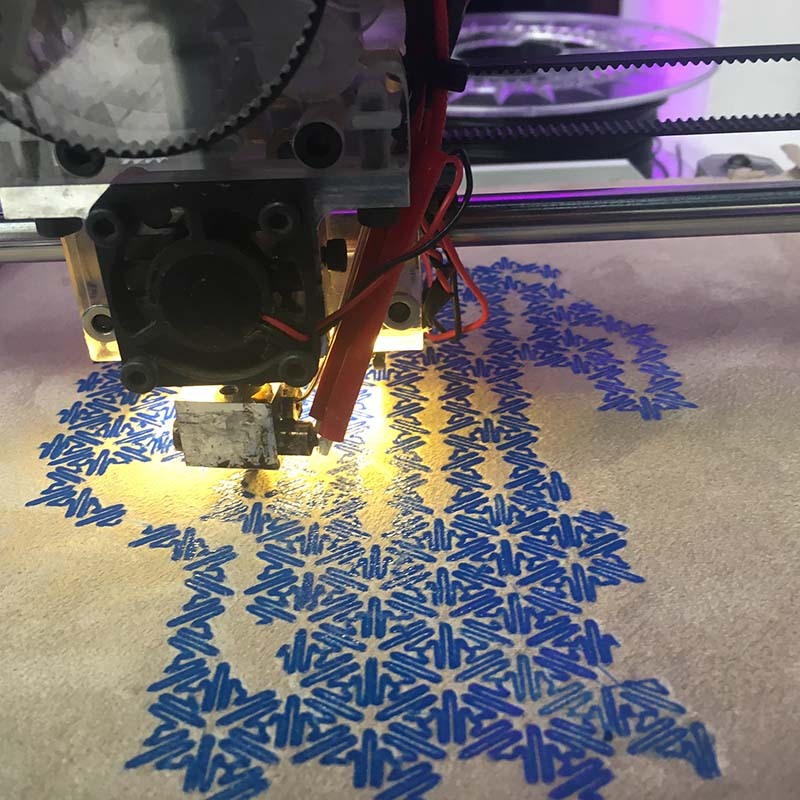 We have used the customizer application of Thingiverse and the mesostructured materials development of Andreas Bastian to create different patterns and understand adjustable flexibilities imposed by the density, the shape, the thickness and the height. Flexible structures, auxetic, bistable geometries are one of the options on 3D printing for elastic performance. We also had some participants that brought patrons and wanted to digitalise them, so we made an “easy patron” tutorial. We took pictures of the paper patron and designed their outlines in Rhinoceros. 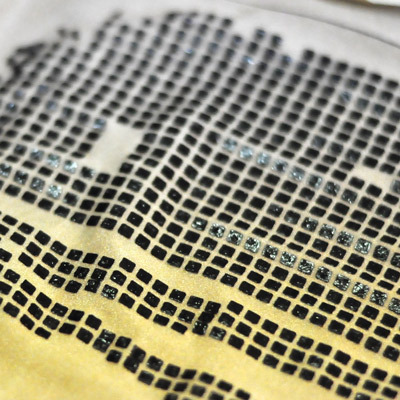 We also applied patterns for laser engraving on the synthetic neoprene that turn to be darker after the etching. White color turns brown and dark colours would not make much difference.